Hello and welcome, we are The Nancy Rayguns. We come from the past: the 1980s to be exact. Word reached us that following the ‘80s, music became stagnate and totally not bodacious. Something had to be done. With the help of our VAL-2600 supercomputer, we have converted a 1981 Volkswagen Vanagon into a rad time machine and traversed time and space to save the world from bogus music (while seeking out filling stations with diesel fuel to power our time machine van). Our mission? To rid the world of “modern” bogus music and party proper with the sweet bitchen jams of the 80’s. 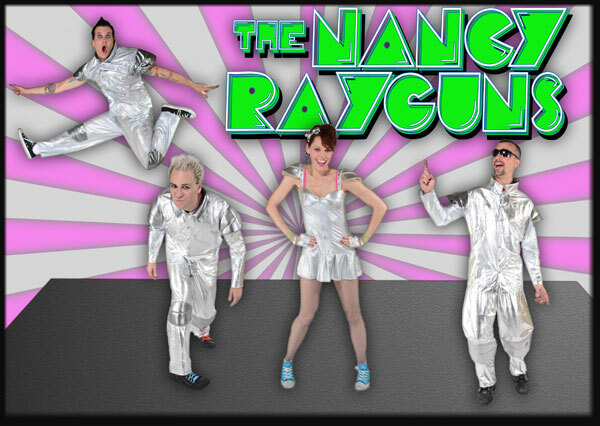 Not just a cover band, the Las Vegas-based Nancy Rayguns is a SHOW, complete with stage sets, music videos, comedy, and of course VAL-2600, 1985’s most powerful interactive supercomputer. The Nancy Rayguns plays at top venues in Las Vegas and is a featured band at The Fremont Street Experience. Wanna Book The Nancy Rayguns? You can book The Nancy Rayguns for your next event just by clicking the "Book Them Now" button to the right and filling out the form. We will be in contact with you about their availability as soon as possible.